In my opinion this is the most important new feature in DAX since… well, forever. It allows you to create a new type of calculation – which in most cases will be a time intelligence like a year-to-date or a previous period growth – that can be applied to multiple measures; basically the same thing that we have been doing in SSAS Multidimensional for years with the time utility/shell/date tool dimension technique. It’s certainly going to solve a lot of problems for a lot of SSAS Tabular implementations, many of which have hundreds or even thousands of measures for every combination of base measure and calculation type needed. I’m not going to repeat any of the detailed technical information in the blog post here, though. Instead the point I want to make is that this is very big news for SSAS Multidimensional users too. In the past couple of years many people who have existing SSAS Multidimensional implementations have thought about migrating to SSAS Tabular so they can take advantage of its new features or move to the cloud, and indeed many of them have already migrated successfully. 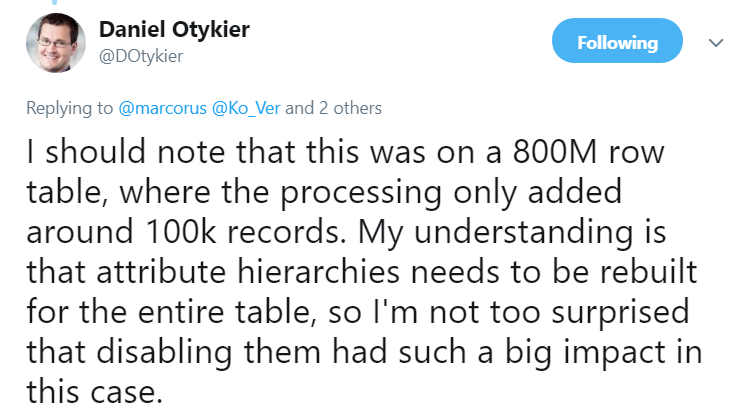 However, up to now, the biggest blocker for those wanting to migrate from Multidimensional to Tabular has been the fact that some complex calculations that can be expressed in MDX cannot be recreated (or recreated easily and efficiently) in DAX, because DAX has not had an equivalent of calculated members not on the Measures dimension or the MDX SCOPE statement. Calculation groups do not remove this roadblock completely, but they do remove the roadblock for a large group of existing SSAS Multidimensional users whose only complex calculation requirement is a time utility/shell/date tool dimension. As a result these SSAS Multidimensional users will now be able to migrate to SSAS Tabular 2019, Azure Analysis Services or Power BI if they want to. Only those people who have more exotic uses for calculated members not on the Measures dimension (which are not very common at all) and those who use SCOPE statements (a larger group – many people working with financial data use SCOPE statements heavily) will find that Multidimensional is still the correct platform for them. I’m at the PASS Summit this week, and in this morning’s keynote there was a demo of the newly-released Azure Data Studio – a modern, cross-platform tool for managing and querying SQL Server, Azure SQL Database and other Azure data services (it’s carefully described as “complementary to” SQL Server Management Studio rather than a replacement for it; this blog post has a detailed discussion of this question). I think it’s pretty cool, BUT… it doesn’t support Analysis Services. I had a moan about this and the generally poor state of Analysis Services tooling on Twitter, was invited to meet some of the developers and was told that if enough people request Analysis Services support it might happen. I’d like to be able to connect to and manage Analysis Services Multidimensional and Tabular on-premises and Azure Analysis Services; if that’s too ambitious I could settle for supporting only Analysis Services Tabular 2016+ and Azure Analysis Services. Since we will soon be able to connect to a Power BI Premium capacity as if it was an Analysis Services instance via XMLA endpoints, I would want to be able to connect to Power BI Premium capacity too. I’d want to be able to run DAX and M queries, and ideally MDX queries too. I would also want to be able to work with ASSL and TMSL for scripting and editing objects. 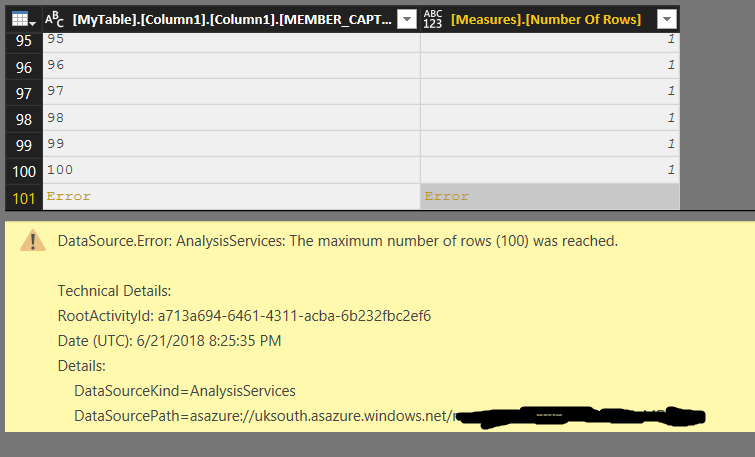 Azure Data Studio has a Profiler extension that works on xEvents; it would be great if that worked with Analysis Services xEvents too. DAX and M Jupyter notebooks would be really useful! It would make sense for some of the functionality of existing tools like DAX Studio and BISM Normalizer being turned into extensions. I don’t like writing reviews of books or products here on my blog for a couple of reasons, the main one being that I don’t usually have the time to read/test/understand something properly so I can write a thorough review. That said I do get sent a lot of free books and evaluation licences for products that deserve a wider audience, so I thought I would write a post rounding up some of them along with a few thoughts of my own. I also saw recently that OKViz (part of the Marco and Alberto/SQLBI family) now have a paid-for version of their excellent Smart Filter visual with some premium features – see here for more details; similarly new features in Klaus Birringer’s Ultimate Waterfall and Ultimate Decomposition Tree visuals are only available in the paid version. 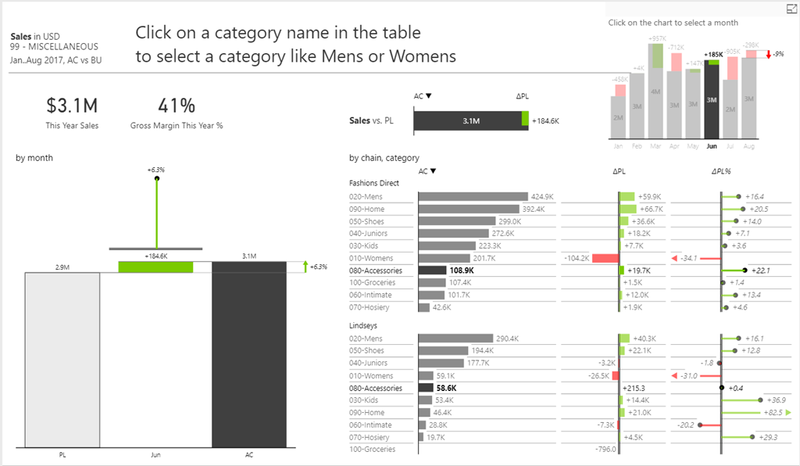 I know many Power BI users who use custom visuals have suffered with various bugs and limitations in functionality over the past few users, and I think buying commercial custom visuals rather than relying on free equivalents is one way of dealing with reliability and support problems. It’s certainly in Microsoft’s interests to have a thriving partner community in this space given that flashy visuals are a major selling point of the product. But will Power BI users want to pay for visuals when so much is available out of the box for free, especially when the cost of the visuals seems relatively high when compared to the overall cost of Power BI? I guess we’ll see. A lot of what I’ve just said about custom visuals also applies to custom connectors, although custom connectors are a lot less mature (at the time of writing, support for custom connectors in the on-premises gateway is still in preview). However I was pleased to see this announcement from CData software that they now have over 100 custom connectors available for Power BI. 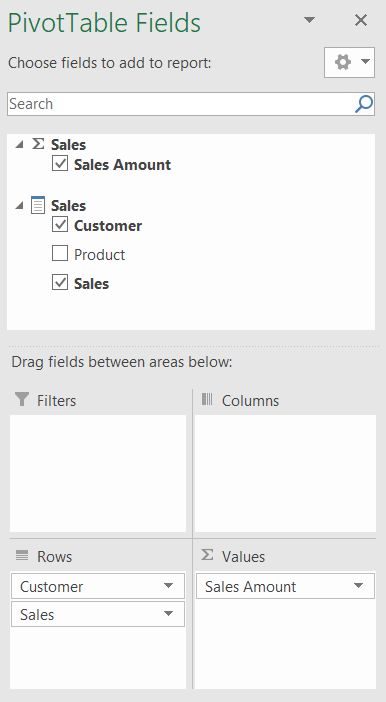 It looks like what they have done is wrapped their existing ODBC providers, and as a result some of their connectors are for sources that are already available in Power BI, but even so there are a lot of new data sources here. Incidentally, I got very, very excited when I realised that the CData connectors for Excel and Excel Online supported DirectQuery mode as well as import mode. Why, I hear you ask? Well, just think about a planning/budgeting solution where users can enter data into an Excel spreadsheet and when the numbers change in Excel, the numbers change in Power BI too; think also how this could work with Composite Models. I tried this with CData’s Excel on-premises connector and unfortunately it returned errors when the source Excel worksheet was open; I did get it to work with the Excel Online connector but it was painfully slow, even with a small amount of data. If I can get it to work better (and I may be missing some optimisations within the connector) I’ll blog about it. One of the few Power BI-related books that have been published recently is Phil Seamark’s “Beginning DAX with Power BI”. He was kind enough to send me a review copy; it’s a good introduction to the subject and I particularly like the way he introduces DAX variables early one. Definitely worth a look if you’re just starting to learn DAX. I was also sent a copy of a slightly older book, David Parker’s “Mastering Data Visualization with Visio 2016”. David knows pretty much all there is to know about using Visio for BI (his blog is great) and while this book doesn’t cover the most exciting new development in this area – the Visio custom visual for Power BI – if you want to learn all the advanced features of Visio that you could take advantage of in Power BI then this is the book to get. 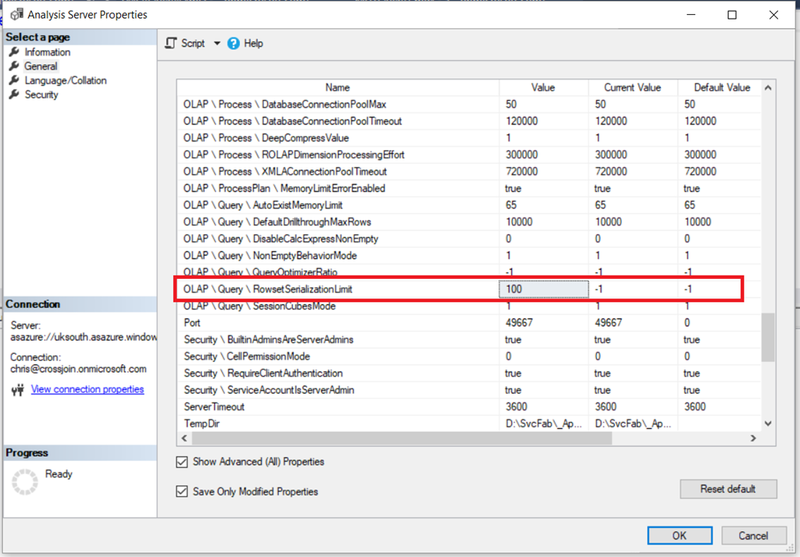 I’ve been a big fan of SentryOne’s SSAS monitoring tool, BI Sentry, for years now but up until recently it only supported SSAS Multidimensional. 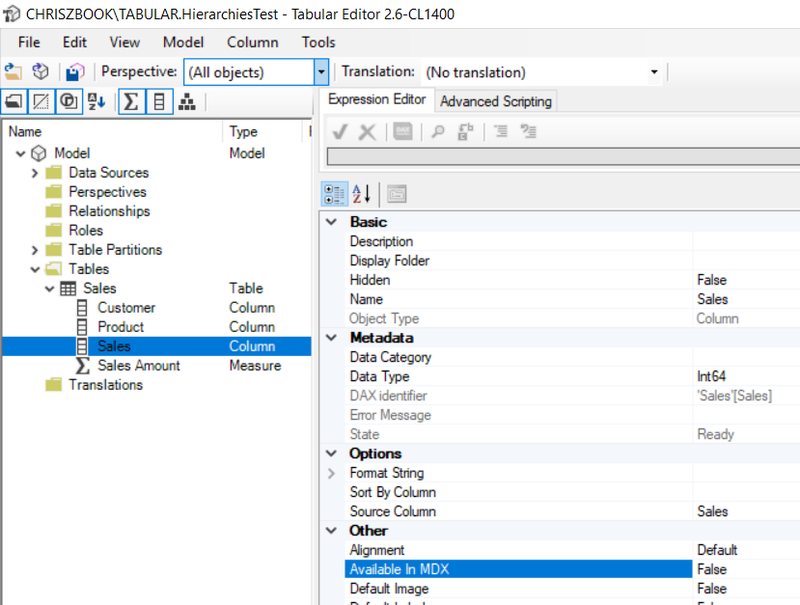 It now supports SSAS Tabular too (details here), and it looks like SentryOne have done a great job of adapting it to the specific needs of the Tabular engine. I always advise my SSAS customers to invest in some kind of monitoring solution because it makes the job of detecting and solving issues like poor query performance so much easier, and to be honest BI Sentry is better than anything you would be able to build yourself. Moving onto Power BI, if you need to generate documentation for your Power BI datasets and reports check out Power BI Documenter; the August release looks like it has some cool new features. 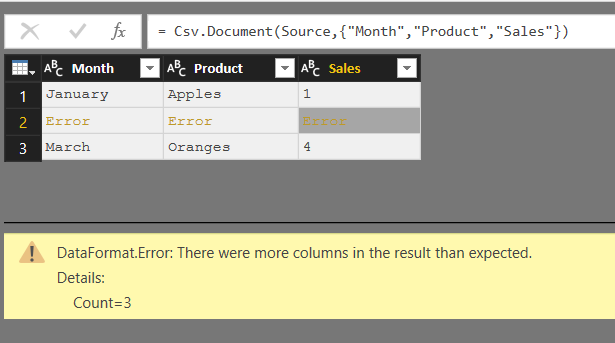 Alternatively the latest release of Power BI Helper also allows you to generate documentation as well as lots of other useful stuff. Something that hasn’t been properly released yet, but will be incredibly useful when it is, is MAQ Software’s Application Lifecycle Management Toolkit for Power BI. Closely related to BISM Normalizer, it will allow you to compare two Power BI datasets, merge changes, deploy only parts of a dataset (for example individual measures), and deploy to multiple datasets – all of which are things Power BI developers have been crying out for. Last of all, the guys at DevScope also have a new(ish) product out, Power BI Robots, which automatically takes screenshots of Power BI reports and dashboards and can deliver them to various destinations such as email address and SharePoint. I haven’t looked at it yet but it seems like it could have a lot of interesting uses. Following on from my post the other week about the new RowsetSerializationLimit server property, I thought it would be a good idea to write about why the new IsAvailableInMDX property (announced in the same blog post) is so important. In fact, I would say that everyone using Analysis Services Tabular 2017 (CU7 or higher) or Azure Analysis Services should spend some time investigating it because the potential benefits in terms of reduced memory usage and faster processing times are significant, especially for larger models. First of all, what does it actually do? As the blog post says, it allows you to stop attribute hierarchies from being built on columns when you don’t need them. But what are attribute hierarchies? 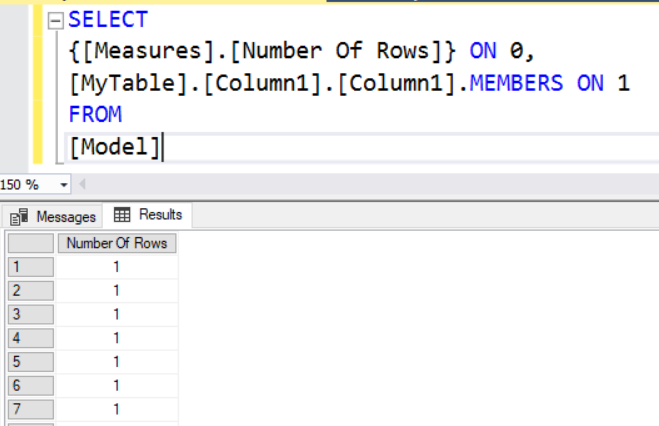 They are structures that are used only when you are querying your Tabular model using MDX; Excel PivotTables, for example, generate MDX queries when they are connected to Analysis Services Tabular whereas Power BI always generates DAX queries. 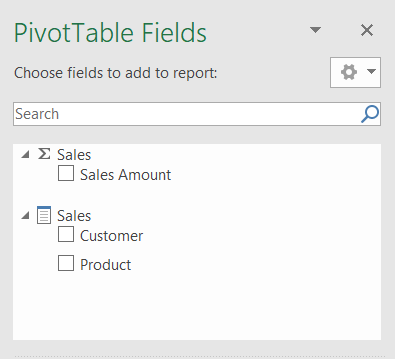 An attribute hierarchy allows a column on a table to be used on the rows or columns axis of an MDX query, and in Excel that means you will be able to drag that field onto the rows or columns area of a PivotTable. Attribute hierarchies are used by some DAX functionality too – for example the TreatAs() function (at least for now) needs them to be present to work. Frustratingly, the DAX functionality that does need attribute hierarchies is not documented. 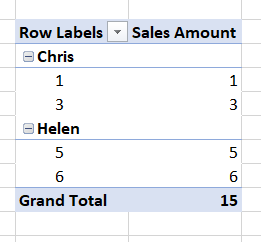 To give you an example, consider a Tabular model that contains a table with three columns, Product, Customer and Sales, and a measure that sums up the values in the Sales column. You’re probably thinking, why would I ever want to use Sales – a measure column – like this? And the answer is you probably wouldn’t, even though Tabular allows this by default. What’s more, building the attribute hierarchy for Sales makes processing slower and the resulting hierarchy uses memory, so all this comes as a cost. The IsAvailableInMDX property is therefore very useful because it allows you to stop attribute hierarchies from being built on columns like Sales where they serve no real purpose. On my laptop, with IsAvailableInMDX set to true for all ten columns, a full process on this table took around 105 seconds and the table size reported by Vertipaq Analyzer was 381MB. After changing IsAvailableInMDX to false for all ten columns, the time for a full process went down to around 81 seconds and the table size was down to 191MB. In summary, this is one of those seemingly obscure technical changes that turns out to be way more useful than you might think. If you test out setting IsAvailableInMDX on your Tabular model, please leave a comment letting me know what kind of impact it had! 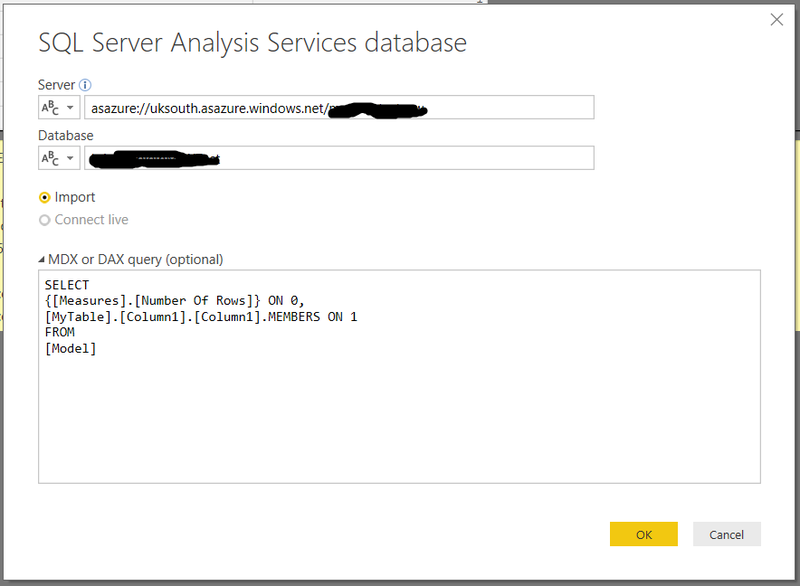 How Much Does Azure Analysis Services Actually Cost? The prices you see here are somewhat misleading though. They’re not wrong, but they do not challenge the assumption that you will use Azure Analysis Services in the same way as an on-premises instance and therefore they allow you to make further, incorrect assumptions about cost. A lot of my customers look at the monthly cost and assume that’s what they will actually be paying monthly – and more often than not come to the conclusion that Azure Analysis Services is too expensive for them. In fact the situation is a lot more complex and Azure Analysis Services (especially at the enterprise level) might end up being cheaper than you think. Let me explain why. When you are planning an on-premises deployment of Analysis Services you need to specify your hardware and licensing so as to be able to handle these periods of high usage, even if for most of the time usage is a lot lower. This means that enterprise-level deployments of Analysis Services can be expensive because you need servers with a large number of cores and a lot of RAM and you may also need to use network load-balancing to scale out over several servers. On the other hand Azure Analysis Services is able to scale up and scale out on demand, and you only pay for what you use. Scaling up means moving to a higher performance level (ie a SKU) within a service tier, or even moving up a service tier. Scaling out means adding replicas of your existing Azure AS instance and database. One other thing to point out is that if you pause an instance of Azure Analysis Services you pay absolutely nothing. 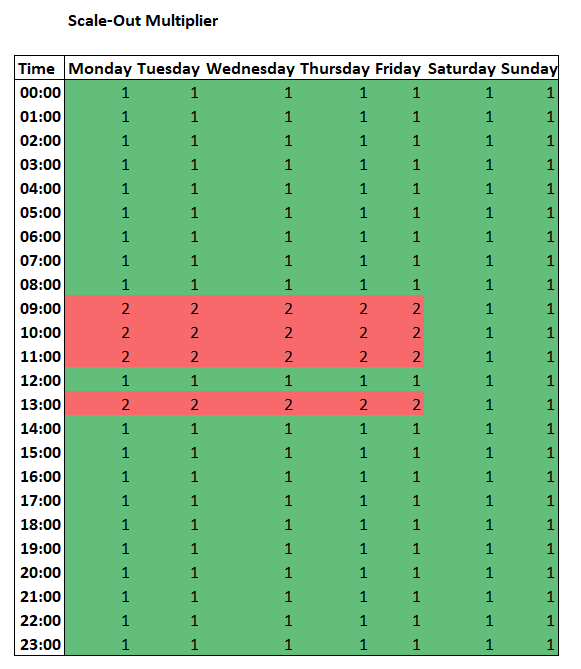 Then there is a table with one cell for every hour of every day of the week, with the performance level required for that hour. 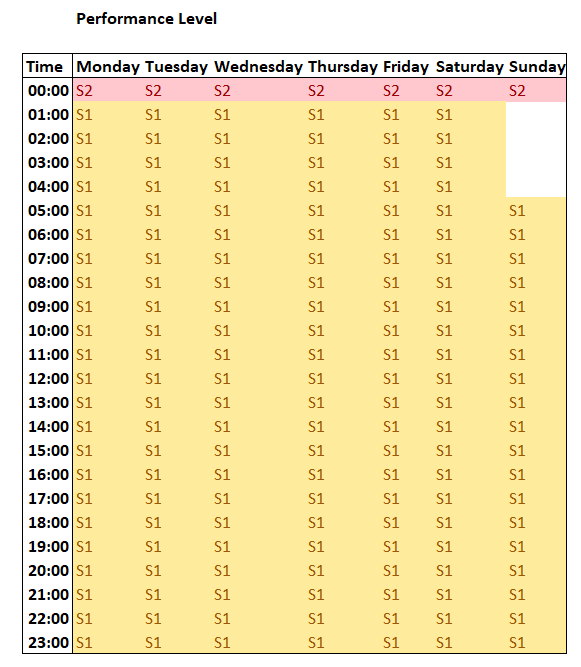 In this example most of the time an S1 instance is required except for at midnight every night where processing is taking place and an S2 is needed. For four hours on Sunday morning the instance is paused. 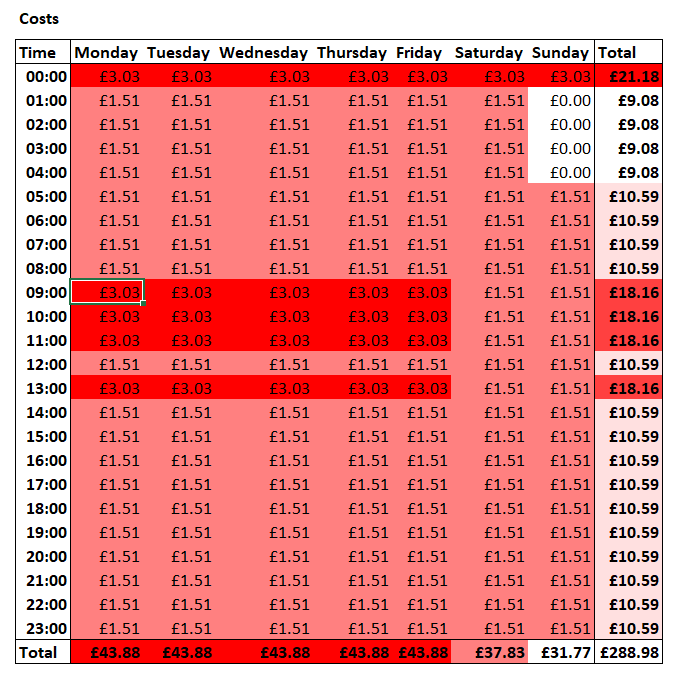 In this example the monthly cost for January 2018 is £1287.56, which is only slightly more than the £1104.48 you would pay to have an S1 instance for a whole month. You can download a copy of the workbook here. In summary, my point here is that pricing an implementation of Azure Analysis Services is complex because of its flexibility. I am not saying that Azure Analysis Services is cheap, or cheaper than using Analysis Services on a VM in Azure or on premises – that’s a subject for a completely separate discussion. Hopefully, though, this post gives you a better idea of how much you might pay if you do use Azure Analysis Services for a project. 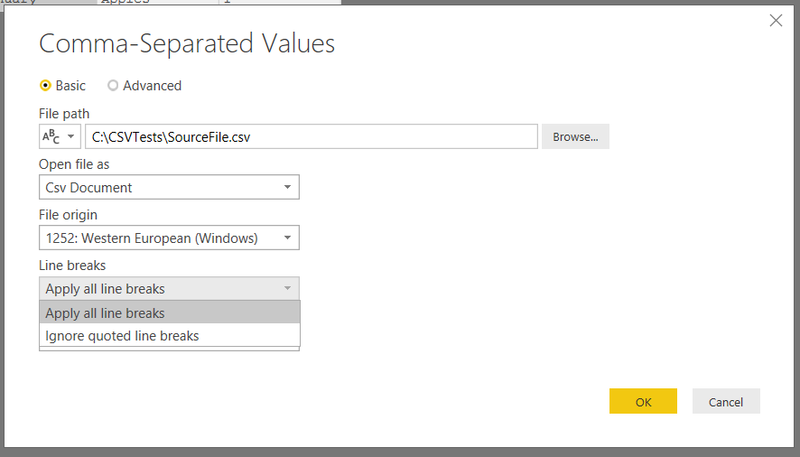 CSV files are one of the most commonly used data sources in Power BI and Power Query/Get&Transform, and yet the documentation for the Csv.Document M function is very limited and in some cases incorrect. In this rather long post I’ll show you as many of the capabilities of this useful function as I’ve been able to discover. In both of these examples I’m relying on the default behaviour of the Csv.Document function with regard to delimiters and other properties, which I’ll explain in more detail below. The query above shows the Csv.Document function with a record in its second parameter containing four fields: Delimiter, Columns, Encoding and QuoteStyle. There is also a fifth field that can be added to the record, CsvStyle, but this cannot be set anywhere in the UI. 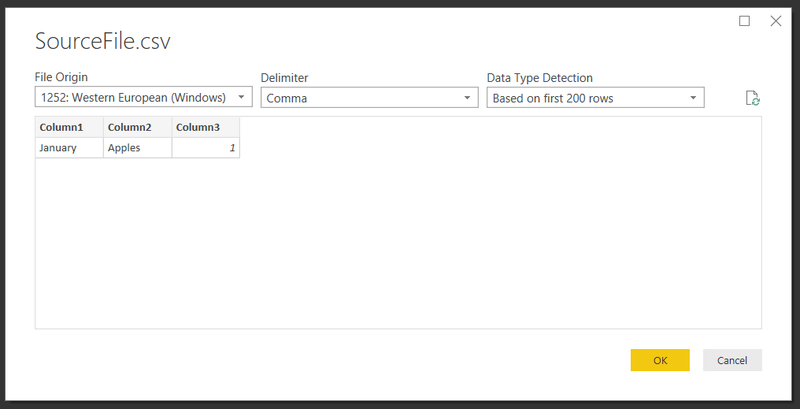 The Data Type Detection option shown in the screenshot gives you three options for detecting the data types in each column of your file: by default it looks at the first 200 rows in the dataset, but you can also ask it to look at the entire dataset (which may be slower) or not to detect data types at all, in which case it will treat all columns as text. In this case data types are not set in the Csv.Document function but in the #”Changed Type” step with the Table.TransformColumnTypes function, but as we will see later it is possible to set column names and data types in a single step with Csv.Document instead. 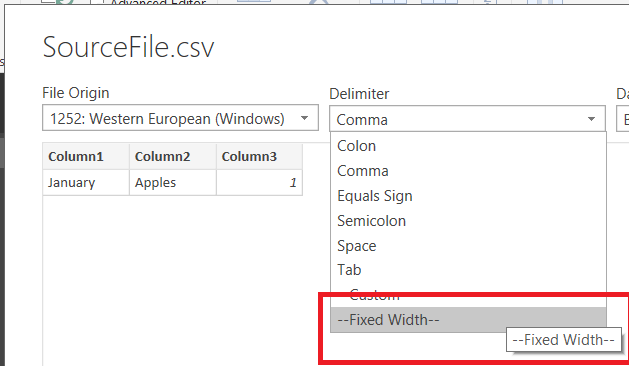 If you specify a single character delimiter at this point then the Delimiter field of the record in the second parameter of Csv.Document is set; the Custom and Fixed Width options shown here use a different form of the Csv.Document function described below. If the Delimiter record is not set then a comma is used as the delimiter. If you want to use a special character like a tab then you need to use an M escape sequence; for example to use a tab character as delimiter you need to use the text “#(tab)” which returns a text value containing just a single tab character. 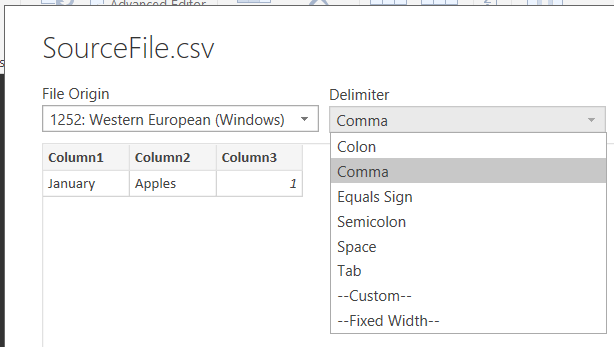 The Columns field is not explicitly set by the user when you first connect to a CSV file via the UI, but the UI infers its value from the number of columns it finds in the CSV file. 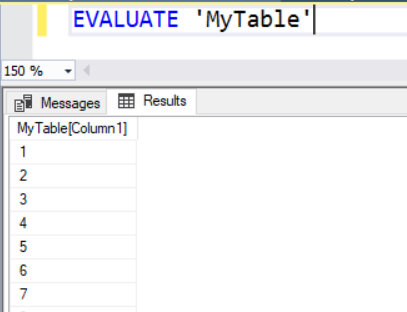 This can be a problem if the number of columns in the source data changes in the future because, as shown above, when the Columns field is set the table returned always has a fixed number of columns. As a result if the number of columns in the data source increases in the future you will find columns on the right-hand side of the table are not returned; similarly if the number of columns decreases you’ll see unwanted empty columns. Several people such as Prathy Kamasani have blogged about this problem and it may be better to delete the Columns field from the record, or not set the Columns field in the first place, in order to avoid it. If you do not set the Columns field then Csv.Document returns a table with the number of columns that are present in the first row of your source data. The final field that can be used, CsvStyle, is also related to quotes. It can take one of two values of type CsvStyle: Csv.QuoteAfterDelimiter and CsvStyle.QuoteAlways. If the first line of your CSV file contains column headers and you connect to the file using the Query Editor user interface, in most cases this will be detected and an extra step will be added to your query that uses Table.PromoteHeaders to use these values as the column headers. 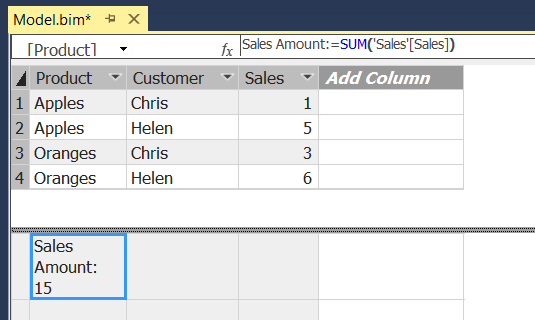 However if you don’t have column headers inside your CSV file, instead of a record it is also possible to supply a list of column names or even better a table type to define the columns present in your CSV file. 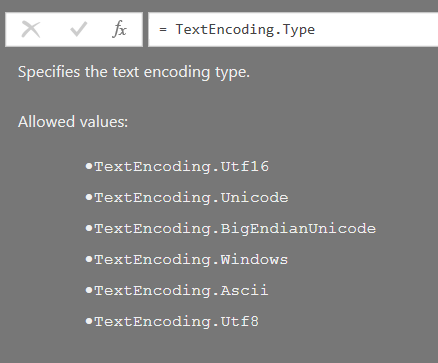 When you do this Csv.Document has three other parameters that can be used to do some of the same things that are possible if you use a record in the second parameter – Delimiter, ExtraValues and Encoding – and they are described below. For example, in the following CSV file there are three columns: Month, Product and Sales. Notice how now the Sales column has its data type set to number. If you have used a list of column names or a table type in the second parameter of Csv.Document, you can use the third parameter to control how each row of data is split up into columns. There are two ways you can do this. The ExtraValues parameter allows you to handle scenarios where there are extra columns on the end of lines. This isn’t quite as useful as it sounds though: most of the time when the number of columns varies in a CSV file it’s because there are unquoted line breaks in text columns, in which case you should make sure your source data always wraps text in double quotes and use the QuoteStyle option described above, or if you can’t fix your data source, see this post. The ExtraValues parameter can take one of three values of type ExtraValues: ExtraValues.List, ExtraValues.Ignore and ExtraValues.Error. On the first and third rows the Extra Columns column contains an empty list. On the second row, however, the Extra Columns column contains a list containing two values – the two values from the two extra columns on that line. What about CsvStyle and QuoteStyle?